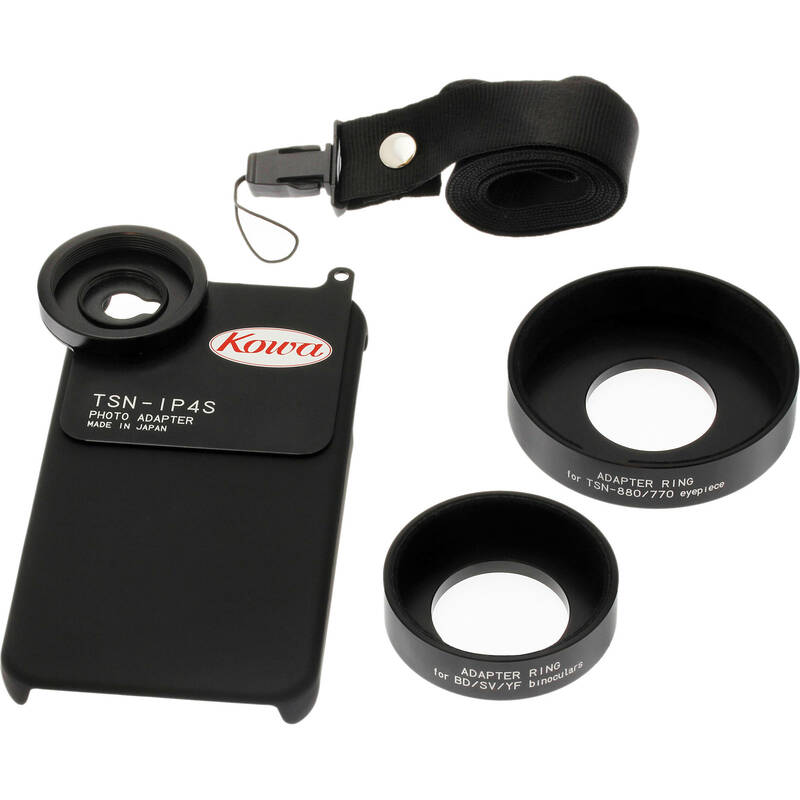 The Kowa Photo Adapter for iPhone 4/4S allows you to effectively use a Kowa spotting scope or binocular as a telephoto lens for your smartphone. The powerful magnification and premium optical components of your spotter enable long-distance photos or video (which you can then share directly from your phone). This adapter includes a phone case and 41mm and 55mm adapter rings; simply screw on the correct ring, press the ring over your spotting scope eyepiece or one of the eyepieces on your binocular and focus with the spotter's or binocular's focusing rings. It is strongly suggested that you use a tripod and remote shutter release for a sharply focused image. Depending on the specific model Kowa eyepiece or binocular that you wish to use, a different, separately sold adapter ring may be required. Box Dimensions (LxWxH) 5.3 x 3.1 x 1.2"
Kowa Photo Adapter for iPhone 4/4S is rated 4.4 out of 5 by 5. Rated 5 out of 5 by JIm from Kowa adapter for iphone I have used this adapter along with my vortex razor. It only takes a few seconds from the time you have an animal in your spotting scope until you have a picture or video of it on your phone. Great for scouting as you can easily download pictures to keep files on certain animals. Rated 5 out of 5 by Maxfli30 from Great product, great price Works perfect with the Iphone 4s... price was good and shipping fast. Rated 3 out of 5 by New to Digiscoping from Does not fit Vanguard HD 82A Was told might fit Vanguard HD 82A which it doesn't. Seems to be made of good quality. I am going to try to modify it to fit. It fits perfectly over the eyepiece cover so I plan on cutting a hole in the eyepiece cover and glue it to the adapter. Should work fine then and probably even fit onto the scope more securely. Rated 4 out of 5 by Birder from Works as promised Using the adapter with my 880 KOWA straight scope I have been able to video and photograph distant birds. Will this work with the Swarovski EL 8.5-42? not sure. I am using it with a Brunton and Bushnell Elite 20x60x80.